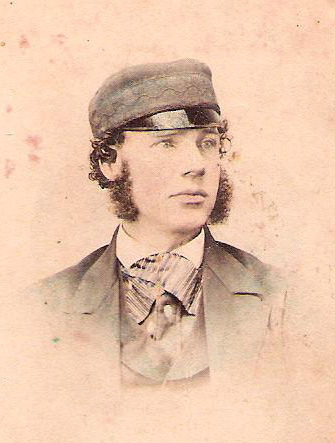 Mary Saxon, a half second cousin of mine, has sent this photo that likely dates from about 1860 or earlier and asks, "Can anyone identify the cap as belonging to a ship line?" She writes that "William Foley was the father of my grandmother, Edith Helen Foley." The picture was taken by the Doane photographers on Place D’Armes in Montreal. The photographer was in business at that address from 1847 to 1865. The story in the family is that he went to sea as a young man before coming to Lindsay, Ontario and may have had his own ship. Helen Foley was the first wife of my grandfather, John McIntosh. William Leslie Sherwood Foley died on February 7, 1912 in Strawberry Hill, Surrey, B.C. The death certificate says his birth date was April 10, 1831. There is an alternate birth date of October 6, 1830. This date is in the baptismal record of St. James Methodist church in Montreal: "William, son of Thomas Foley, Plasterer, of Montreal and of Elizabeth his wife was born the sixth day of October one thousand eight hundred and thirty and baptized this twenty ninth day of July one thousand eight hundred and thirty one by me William Squire Minister. Thomas Foley and Elizabeth Foley parents." My mother obtained this info in the 1980’s and I can’t explain the discrepancy in dates. I’m sure that Thomas Foley and Elizabeth Sherwood were his parents mostly because the name Sherwood was used several times in the family. Thomas Foley married Elizabeth Sherwood on December 31, 1827 at St. Gabriel Pre sbyterian Church in Montreal. Also baptized on the same day was his brother James: "James, son of Thomas Foley, Plasterer of Montreal and of Elizabeth his wife was born the fourth day of November one thousand eight hundred and twenty eight and baptized this twenty ninth day of July one thousand eight hundred and thirty one by me William Squire Minister. Thomas Foley and Elizabeth Sherwood Foley parents." Thomas and Elizabeth had at least seven children. I was able to find baptismal records recently of two daughters. Selina (sixth child) was born May 11, 1839 and Mary Elizabeth (seventh child) was born November 15, 1841. They were baptized by John Hutchinson, Minister on June 6, 1842 at Methodist New Connexion of the Henrysburg Circuit in Montreal. In my research, done several years ago, I found a family of Foleys on the passenger list of The John Barry that sound like they might be the family of Thomas Foley. They came from Ireland to Quebec in 1825. Listed were William Foley (age 44), Ellen Foley (age 24), William Foley (age 22), Thomas Foley (age 18) and Daniel Foley (age 16). I believe they settled in Emily at first. Although the census records say William Foley was a shoe salesman, a hardware clerk and a hardware merchant the story in the family is that he went to sea as a young man before coming to Lindsay and may have had his own ship. I haven’t been able to find any evidence of this yet. William married Fritta Jane Greener in Lindsay on May 5, 1869. They were married by her adopted father Rev. James Greener , Wesleyan Minister at Lindsay. The marriage record says: "William FOLEY, 35, Montreal, Lindsay, s/o Thomas & Elizabeth, married Fritta Jane GREENER, 26, Clarendon, Lindsay, d/o James & Jane, witn: Aurelie CRICE & Thomas FOLEY both of Lindsay on May 5, 1869." How can one man have so many different records for his birth date? Cenus records are notoriously unreliable but there is a pattern here. The records referred to below are all for the same man yet yield different birth years. A possibility is that he married a women 13 years younger than himself and so over time chose to falsify his age. This practice has been seen before by researchers and is something we can all imagine happening. Why Apr 10 is used instead of Oct 6 leaves a small doubt in our minds but again we have seen this before as well.